Providing you the best range of vernier height gauge with effective & timely delivery. We are engaged in manufacturing Vernier Height Gauge. 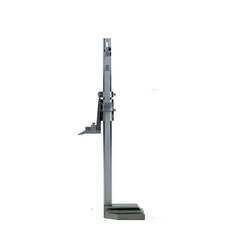 This is an instrument to measure the height of an equipment using verinier scale. Our range of Height Gauges are designed for measuring the heights of tools, laboratory apparatus etc with greater accuracy. A verinier Height Gauge consists of a magnifier reading glass, metallic body and adjustable slide scale. Looking for Vernier Height Gauge ?